The Revolutionary Incognito System Takes “Discreet Braces” to a Whole New Level! When it comes to state-of-the-art invisibility, patented Incognito™ technology from 3M truly shines. Our team at California Dental Care & Orthodontics is pleased to offer patients the opportunity for unique lingual braces in Rancho Cucamonga – Incognito braces give you a beautiful smile even while you are wearing them! Want to know if you’re a candidate for braces or Invisalign? Take Our 30-Second Quiz Now To Find Out! The word “lingual” refers to the “tongue side” of your mouth. That means that lingual braces are a method of orthodontic treatment where all the brackets, wires and elastic bands used to realign your teeth are mounted on the back of your teeth. 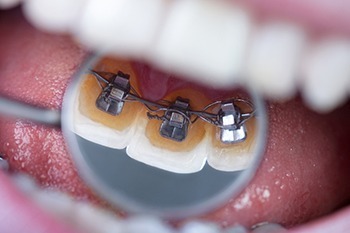 This type of “inside” braces is popular with teens and adults who prefer a greater level of aesthetics and discretion during orthodontic treatment, such as patients who are public speakers, actors, singers, or salespeople. Your Incognito lingual braces deliver exceptional results, but no one will be able to tell you are straightening your teeth. At your first appointment, our orthodontist will take a digital scan of your teeth. Your brackets and wires will be 100% customized for your unique mouth, using computer-aided design, 3D printing technology and robotics for the most effective and precise tooth movement. In addition, this tailor-made design means that the brackets are a perfect, comfortable fit. Make Your Appointment for Our Amazing Lingual Braces in Rancho Cucamonga Today! We invite you to take advantage of our completely FREE Orthodontic Consultation, which includes a complete oral examination, digital x-rays, and a consultation with one of our orthodontic specialists. For a limited time, we currently offer $1,000 off any orthodontic treatment and 1/2 off in-house teeth whitening after your treatment is complete! Call 909.945.0024 or click here to request an appointment today. New patients also receive a special bonus gift! As one of the premier dental and orthodontic practices in Rancho Cucamonga, CA, our team at California Dental Care & Orthodontics also provides top-rated oral health care to patients from Alta Loma, Ontario, Upland, Claremont, Fontana & Rialto, CA.